Over the past month we have been talking about the Paleo diet – focused on what are the right kinds of foods for you to eat. Now that you’ve rid your kitchen of the boxed foods, staying away from wheat and other grain, and are choosing more whole foods, you have taken the first step toward health and wellness! Is there more, you ask? Of course! Now we need focus a bit more on how much of these healthy foods you are eating and in what combinations. For this, CrossFit takes a step beyond the simplicity of “eat meat and veggies” and introduces the Zone diet. The goal with Zone living is to reduce inflammation and stabilize blood sugars, and for this reason Zone draws a strong parallel with the Paleo diet. But Zone adds additional dimensions – quantity and combinations of macronutrients – to improve your athletic performance and maintain wellness for a longer period of time. While CrossFit has historically used the Zone prescription to help athletes optimize physical performance, if you are like so many of us who have a tendency to overeat, the Zone diet can also offer guidance that is key to weight loss, toning, and overall improved health and wellness. With the Paleo diet our focus through this past month, we worked to eliminate the traditional carbs of wheat and grains in favor of non-starchy vegetables. 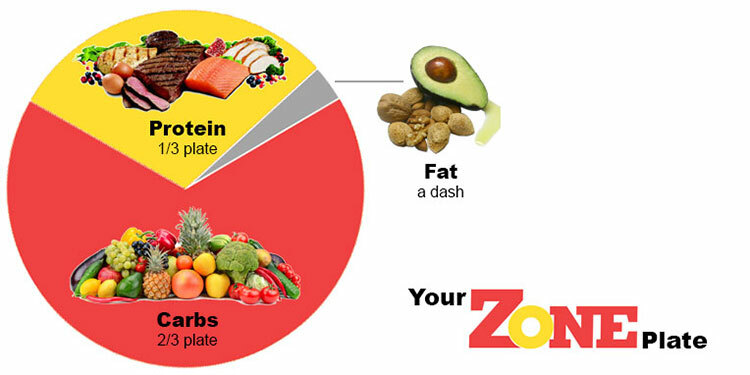 Zone takes this a step further, prescribing a combination of macronutrients of about 30% lean protein (about the thickness of your palm), 40% carbohydrates via fruits and vegetables that are not starchy or high in sugar, and 30% monounsaturated fat from natural sources (such as olive oil or almonds or avocado). So what does this look like on my plate? It looks like 1/3 of the plate is protein and 2/3 of the plate is vegetables with a little fruit. Good stuff! You can track carbs/proteins/fats in an app like MyFitnessPal, a free app that you can download to track the foods you eat, even at restaurants; water consumption; and caloric intake. (The app also has an exercise component, but WODs are not included in the exercise descriptions.) The app lets you decide if you want to maintain your weight, gain, or lose, and you can even set a goal weight for yourself. Like most apps, you can sign up for MyFitnessPal via Facebook or using an email address. If you use Map My Run or any other Under Armour applications, you can use the same account information in both places. This app is also helpful with recording packaged foods, like protein bars, and restaurant menus – MyFitnessPal will upload the macronutrient components for you. It really doesn’t get much easier! Next week we’ll share a breakdown of Zone from CrossFit founder Greg Glassman, but in the meantime, here’s a really helpful website that can help you understand the breakdown of protein, carbs, fats that you should be thinking about each day as you get your MyFitnessPal account up and running. You might also consider purchasing a digital scale to weight your food on Amazon (you can get one like this for about $20). But if you just want to experiment with Zone and tracking your macros, with the free app is a good place to begin. We also suggest taking your current measurements to gauge your starting point. Whether or not you’ve stuck with your month of Paleo eating, we can restart the journey now, or continue to refine our nutrition to get those optimal results we are striving for! CrossFit SoBro coaches are always available to answer any of your questions about Zone, how it fits into the Paleo theories, or how it can help to enhance your athletic performance. So, don’t hesitate to ask!